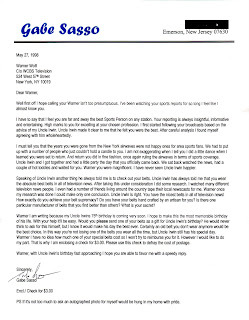 For a period I wrote numerous celebrities asking them for different articles of clothing. These requests were always made to honor my Uncle Irwin in some way. I had varying degrees of success. 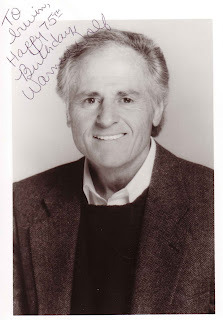 I chose Warner Wolf because of all the NYC area sportscasters I really always liked him best. 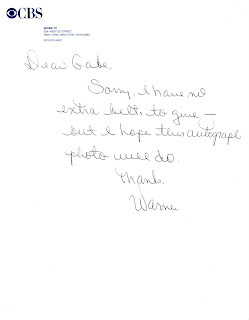 Not only does Warner respond, he gets style points for the handwritten note. At least Warner came through with the picture. Of course I asked for the picture to be autographed for me. But since he couldn't come up with a spare belt for Uncle Irwin I guess he figured the photo would do. I think the photo being addressed to Irwin is funnier anyway. He also returned the check of course.